Hangout and make your own digital designs and computer programs using a variety of tools: Scratch, Bitsbox, Micro:bit, SketchUp, Tinker CAD, Arduino programming, and more. Launch with a short lesson using one type of technology that relates to the month’s theme. Work on monthly challenges or designs of your choice and share your work! Bring a laptop or borrow one from the Library. Volunteers and experts will be on hand to support. Recommended for youth ages 7-14. 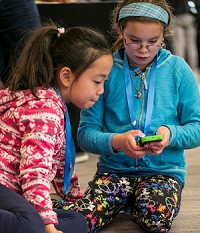 Parents are encouraged (not required) to stay and learn coding too! Start working on a project to present during the CSED Week finale Capstone, Saturday December 8! Youth Maker Hangout meets weekly on Tuesdays 4-5:30pm during BVSD school year. We do not meet on 11/20 and take a break December 12 over the holidays.